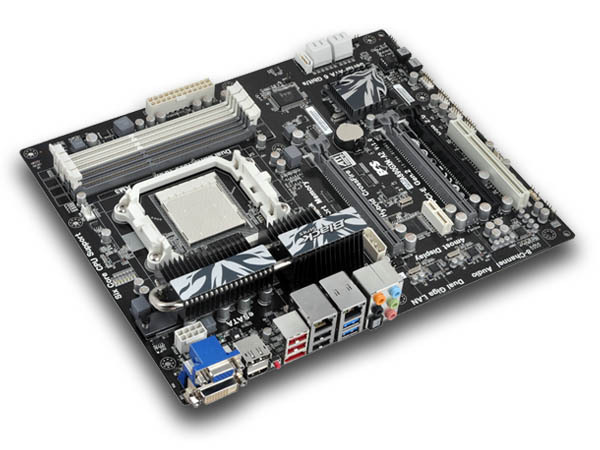 ECS Intros its New A890GXM-A2 Motherboard. ECS (Elitegroup Computer Systems) has introduced its new ECS Black Series A890GXM-A2 which is based on the AMD 890GX Chipset. The Motherboard supports the latest six-core CPU and also provide supreme overclocking features which include “One-step Unlocking” function in “ECS M.I.B. III” overclocking interface allowing users to unlock the hidden cores of CPU easily and with this users can reach a staggering 238% CPU performance boost by unlocking the cores and overclocking them. It also allows you to reach 146% gaming performance boosted by overclocking GPU – ATI Radeon HD 4290 graphics processor’s core clock and same for the memory. The board comes with AMD Turbo Core technology which provides users more performance from the CPU when required. The motherboard also comes with 4 DDR3 DIMM Slots for Dual Channel memory support and has 3 PCI-e x 16 memory slots, One PCI-e x1 and a single PCI slot. Other than that connectivity features include a VGA, DVI and HDMI port for the built in IGP, A couple of USB ports, Firewire and Gigabit Ethernet ports and E-Sata port. “eSATA 6.0Gbps solution” provides 2 times faster speed in accessing external storage than eSATA.